There are many times after a long day of work where I need a little help with dinner. When time is tight and you need to get a delicious, nutritious meal out in minutes, I go for premade seasonings. Why not… the seasonings enhance my food and I’m not hovering over my spice box to see what I should add. Also, the seasonings help me out with a theme for the meal. For example, if I’m using an Indian seasoning packet, I may want to make a quick raita on the side! I have to admit that my most favorite seasoning packet is taco seasoning!! Oh yes, I can easily make a quick batch of tacos, or add this to rice for a Spanish rice or I can sauté veggies with the mix. 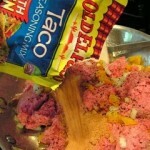 Taco seasoning is so versatile and can help you make a meal in minutes! Enjoy my recipe below, for Taco Turkey and Veggies. 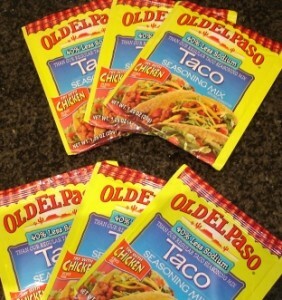 Eat this on its own, on top of rice, create a taco salad or make tacos with this. Enjoy!! Place a pan on medium heat. Once hot, add the oil and onions. Sauté until the onions have softened. Add the celery and sauté for another minute. Add the tomatoes and Worcestershire sauce, stir to break up the brown bits on the bottom of the pan. Add the turkey, garlic powder and seasoning mix. Continue stirring, breaking up the turkey. Once the turkey is cooked, add the frozen spinach, cilantro and cabbage. Stir to combine. Add salt and pepper if necessary. Enjoy this dish as is or on top of brown rice! This entry was posted on Wednesday, April 7th, 2010 at 11:34 am and is filed under Uncategorized.